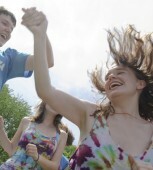 Cuba is a country that has fascinated me since I was a high school student in my hometown of Manchester, New Hampshire. The Communist island is only 90 miles from Florida, but it has been largely off limits to Americans for decades. 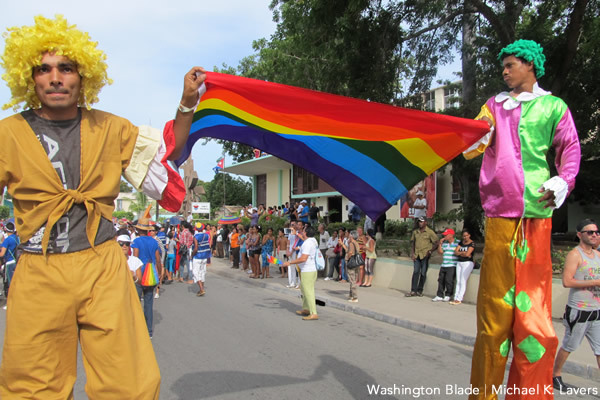 Cuba’s increasingly visible LGBT rights movement, the prospect of normalized relations between Washington and Havana and a press visa from the Cuban government allowed me to see this complex country for myself. 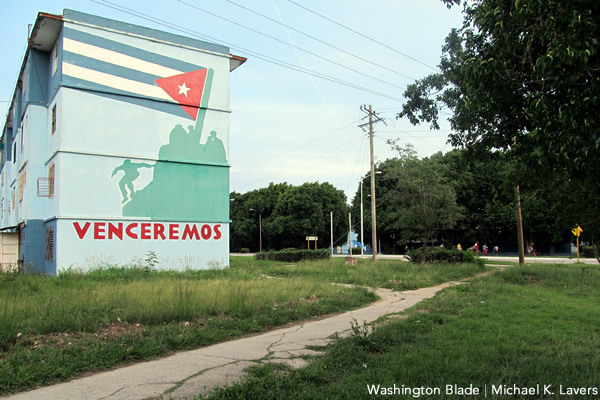 I landed at Havana’s José Martí International Airport shortly before 9:30 a.m. on May 12 — my fight from Miami circled the Cuban capital for nearly an hour because authorities closed the airport with no explanation. 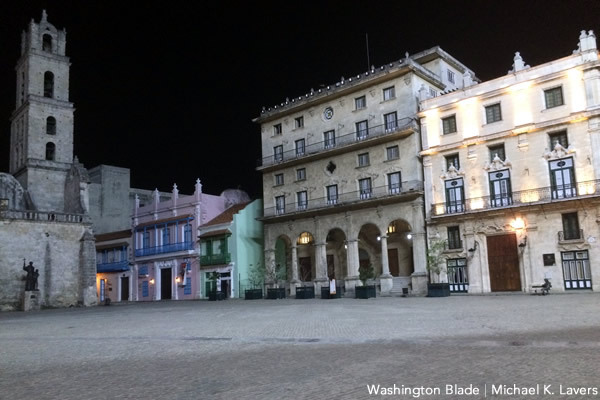 A fellow passenger’s relative drove me to Havana’s iconic Hotel Nacional where I was able to log onto the Internet and let everyone know that I had safely arrived in Cuba. 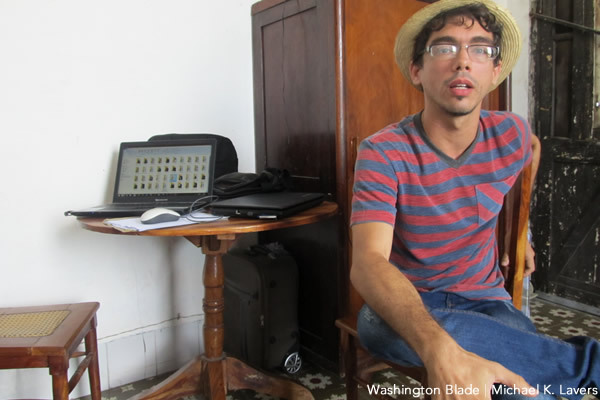 I obtained my Cuban press credentials at the nearby International Press Center before heading to the casa particular (private house) in Old Havana that would become my home away from home in the city. 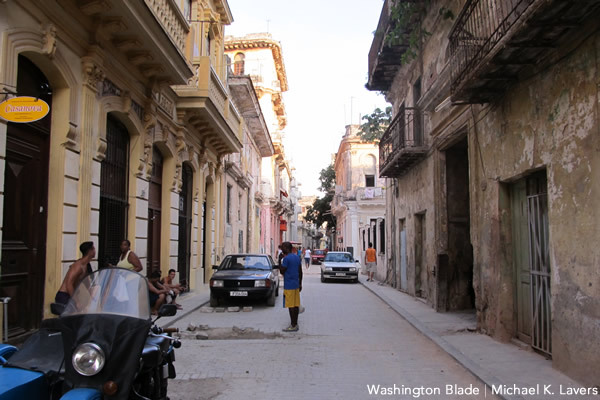 I took a two-hour nap before exploring Old Havana and the area around the Cuban Capitol. 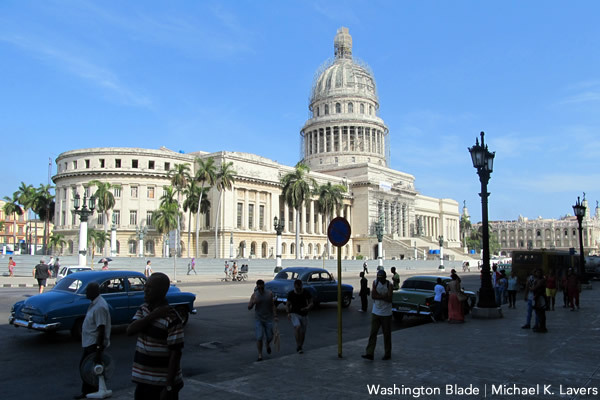 I filed my first post from Cuba from the Hotel Nacional on May 13 before heading to the Plaza de la Revolución. 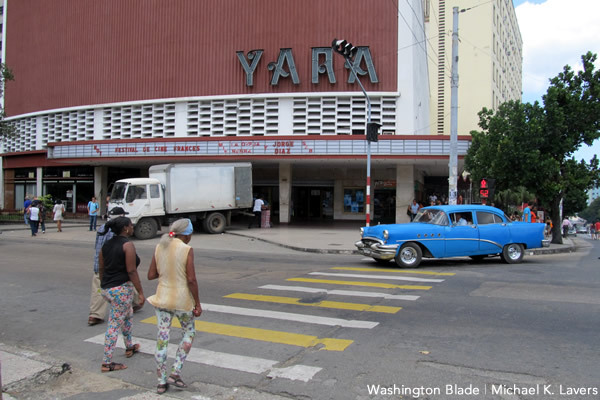 I spent the next several hours in Havana’s sprawling Vedado neighborhood. 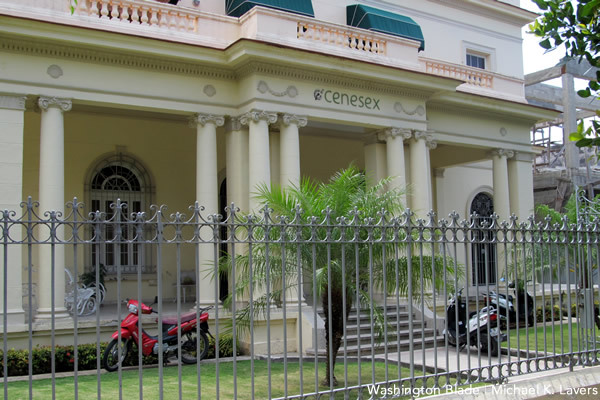 I visited the National Center for Sexual Education, the organization that Mariela Castro Espín, daughter of Cuban President Raúl Castro, who spearheads a number of LGBT and HIV/AIDS prevention campaigns, other places that factor prominently into the lives of the city’s LGBT residents. 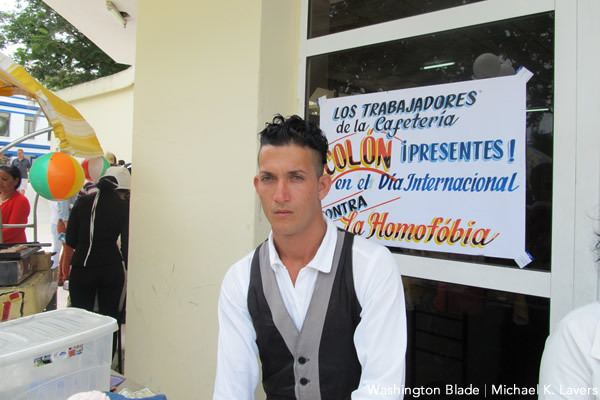 Humboldt 52 is a gay bar near Havana’s oceanfront promenade known as the Malecón that is popular among Cubans and foreigners alike. 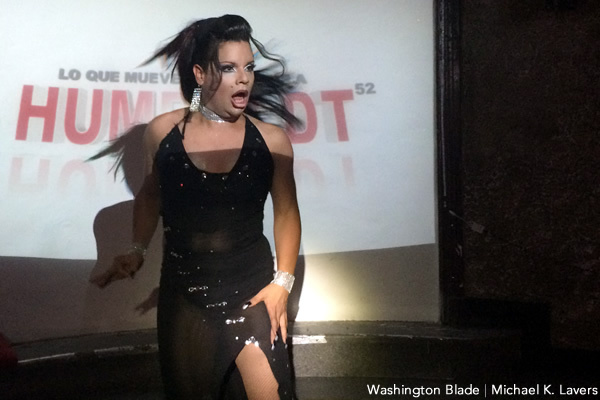 Gala, a drag queen and HIV/AIDS educator who works with the National Center for Sexual Education, is one of the many performers I saw and met while in Havana. 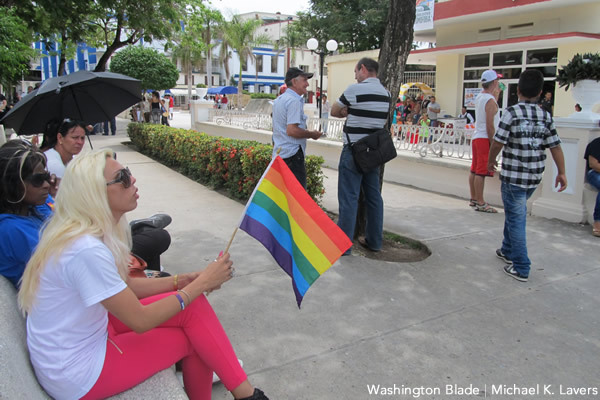 The independent advocates I met in Havana and in the provincial capital of Cienfuegos offered a very different perspective about life for LGBT Cubans that directly challenges Mariela Castro and her supporters. 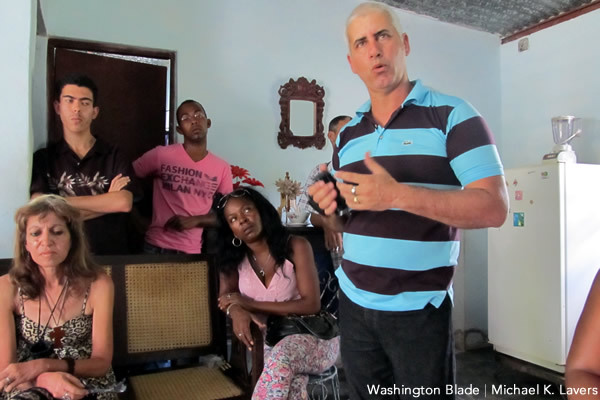 Navid Fernández Cabrera of Proyecto Shui Tuix welcomed me into his home in Havana’s 10 de Octubre neighborhood on May 14. 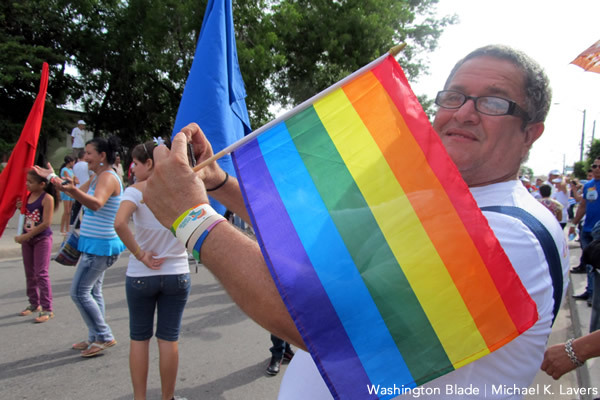 I spent several hours interviewing him and five of his colleagues about their work, Mariela Castro and the National Center for Sexual Education, and their experiences that include frequent harassment from the Cuban government. 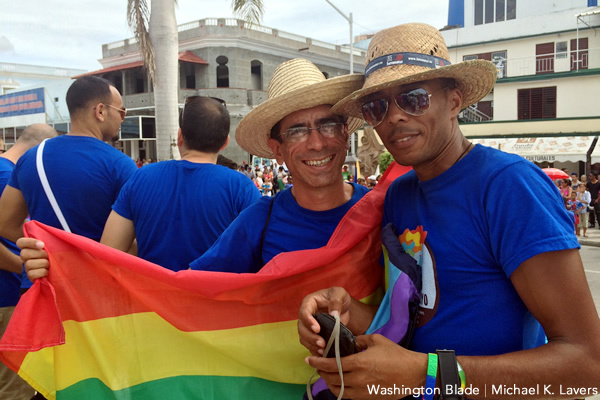 Fernández served shots of rum and dinner — rice with a chopped hot dog, cucumber slices and a handful of tostones (fried plantains) — before heading to a Vedado nightclub where he helped set up the lights for a gay party. 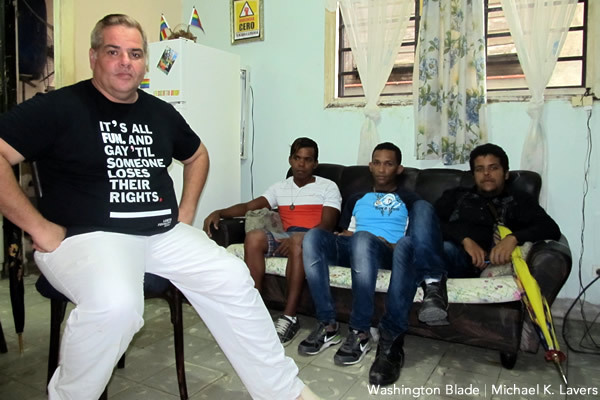 I left Havana on May 15 and drove to Cienfuegos where I visited the headquarters of the Cuban Foundation for LGBTI Rights that is the home of its president, Nelson Gandulla Díaz. 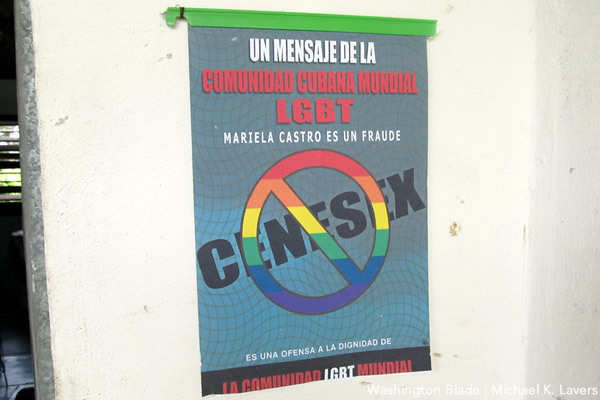 A poster near the door of Gandulla’s home that described Mariela Castro as a “fraud” provided the backdrop of my meeting with him and nearly 20 of his colleagues who included an independent journalist. They offered me homemade cake, flan and juice before I left. 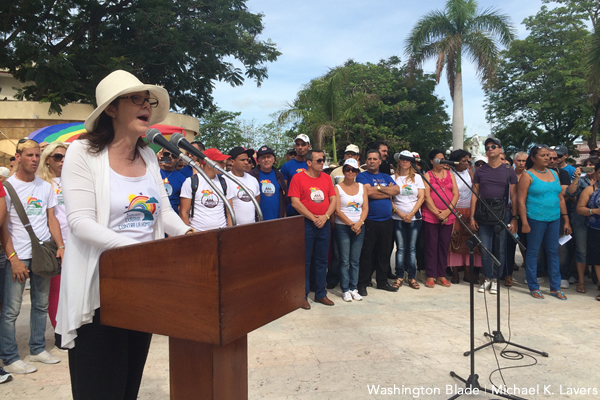 Mariela Castro on May 16 led a march in Las Tunas, a provincial capital that is roughly 400 miles southeast of Havana, to commemorate the International Day Against Homophobia and Transphobia. 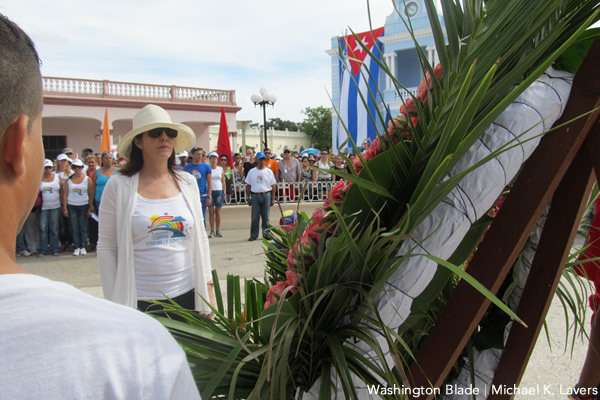 Hundreds of people joined her in the march that ended with her paying tribute to one of Cuba’s “martyrs” from its war of independence with Spain.” Mariela Castro also highlighted the country’s labor code that bans anti-gay discrimination in the workplace as she spoke to her supporters. A number of local businesses placed signs in their windows that indicated their support of the International Day Against Homophobia and Transphobia and the National Center for Sexual Education’s events that commemorated it. 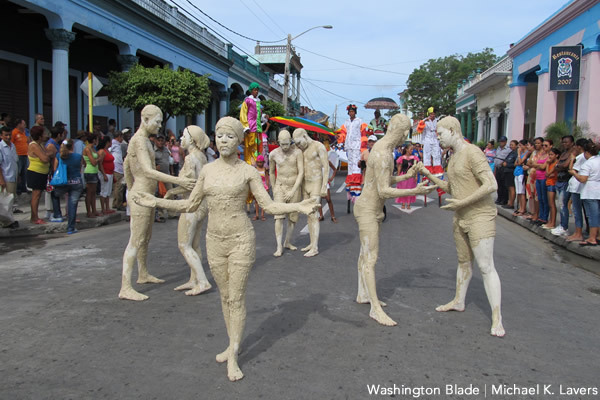 The day ended with a series of performances at Las Tunas’ main theater and a show at a nightclub that featured several drag queens and dancers. 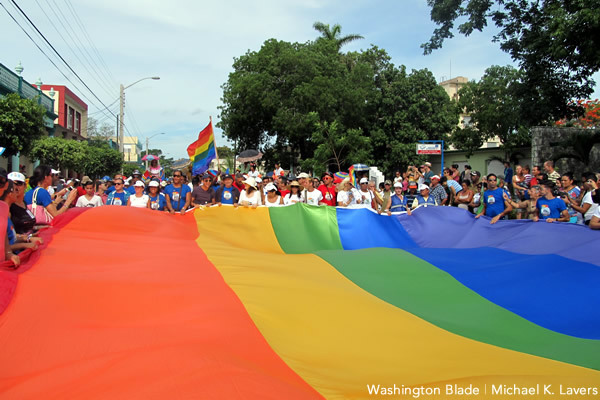 The hundreds of revelers from Las Tunas and Havana who had attended the party slowly walked out of the building after it ended at 3 a.m. A gay Cuban who I met inside invited me to an after-party at a bar on the outskirts of the city. 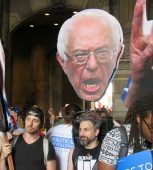 I joined him and a group of his friends who included a boisterous drag queen on a horse-drawn cart that served as a taxi. 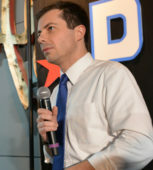 We arrived at the bar about 15 minutes later and joined hundreds of other people who had also gathered there. 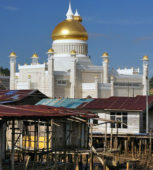 I arrived back at my hotel as dawn began to break over the provincial capital. 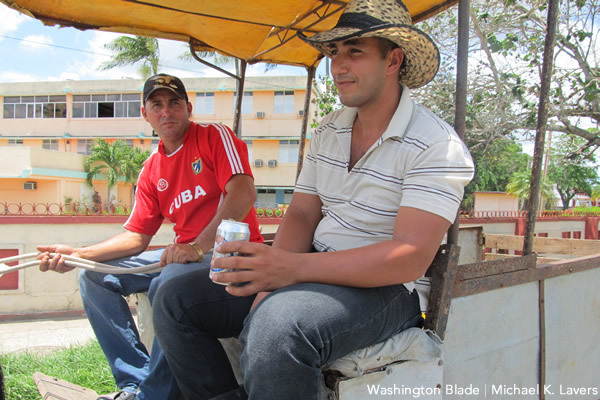 An American photographer was my travel companion for the drive between Las Tunas and the city of Santa Clara on May 17. 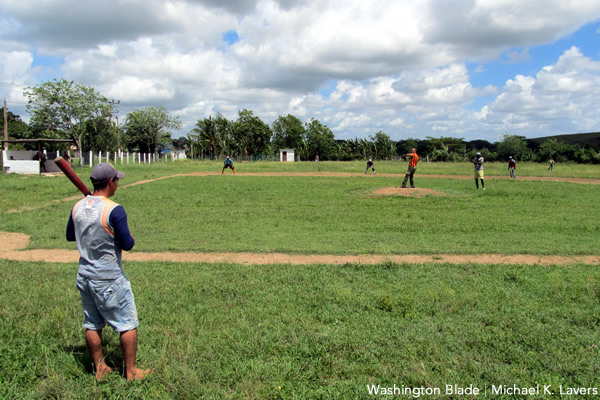 Two baseball teams playing against each other in a field along the National Highway and farmers transporting peppers in a horse-drawn cart are among the sites we saw during our impromptu road trip through the Cuban countryside. 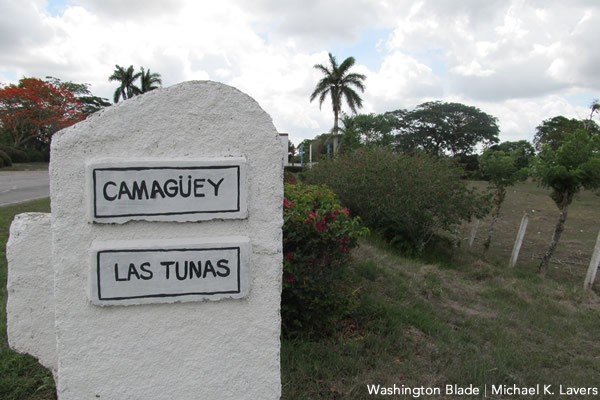 A flat tire delayed my trip from Santa Clara to Sagua la Grande for about half an hour, but I arrived in the small city near Cuba’s northern coastline around 6:15 p.m. on May 17. 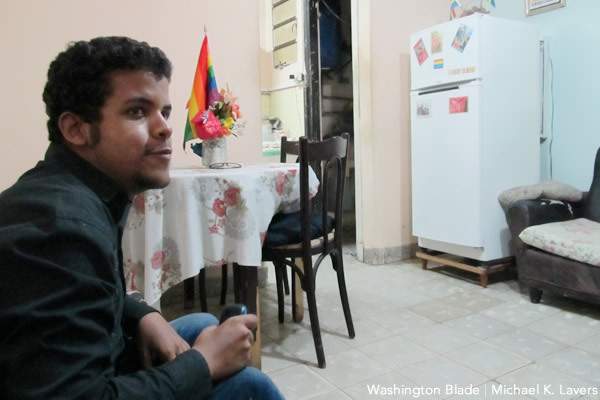 Maykel González Vivero, an independent LGBT rights advocate and blogger who frequently criticizes Mariela Castro and her organization, spoke with me for nearly an hour in the small apartment that he and his boyfriend, Carlos Alejandro Rodríguez Martínez, share in a building that overlooks Sagua la Grande’s main square. 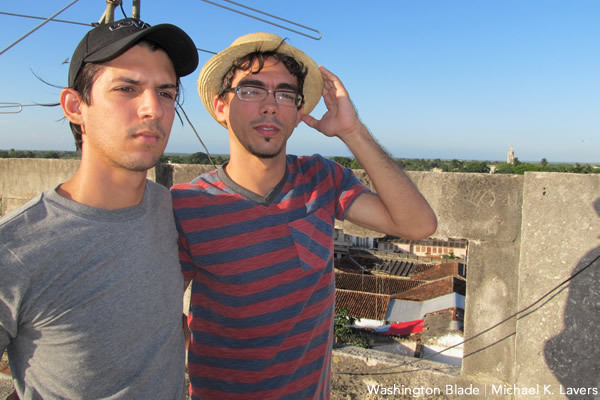 A refreshing ocean breeze had begun to temper the heat of the day by the time González, Rodríguez and I walked up to their roof to take a few pictures. 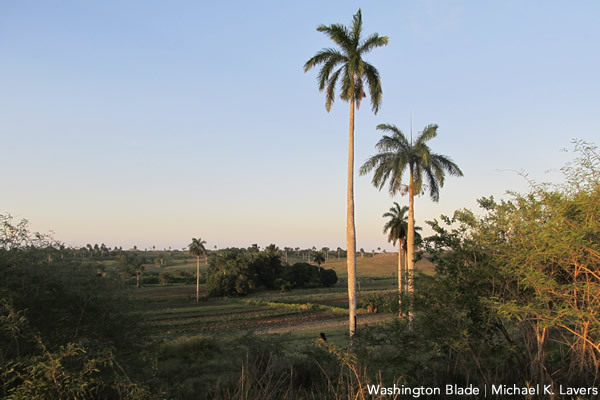 I left Sagua la Grande shortly before 7:30 p.m. and began to drive back to Havana, passing through the cities of Cárdenas and Matanzas. 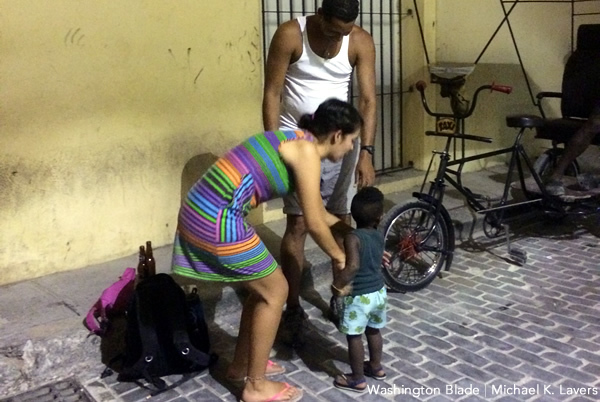 I arrived at the casa particular in Old Havana shortly before midnight where I had stayed earlier in the trip. A police checkpoint where two officers pulled me over and a quick stop at a roadside restaurant for a Cuban coffee to keep me awake delayed my trip. 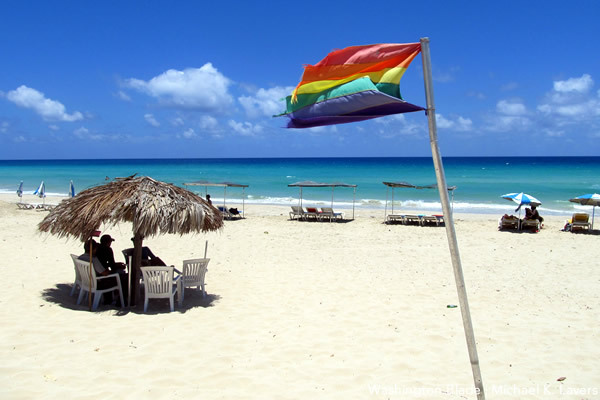 I spent a couple of hours on May 18 at Mi Cayito, a beach east of Havana that is popular with gay Cubans. 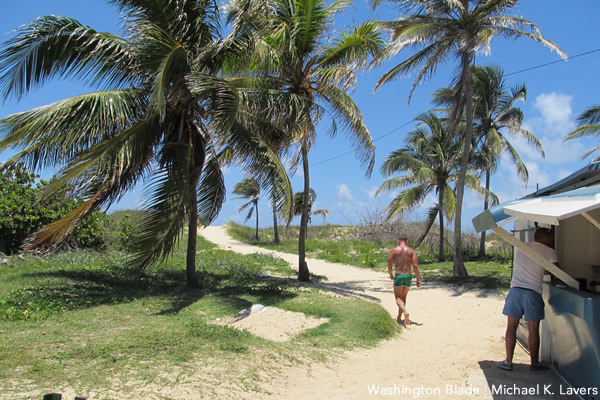 I had the opportunity to speak with a number of beachgoers — including a Swedish journalist and his Cuban boyfriend — before having a quick lunch of black beans and rice and tostones at a small restaurant that was adjacent to the beach’s parking lot. 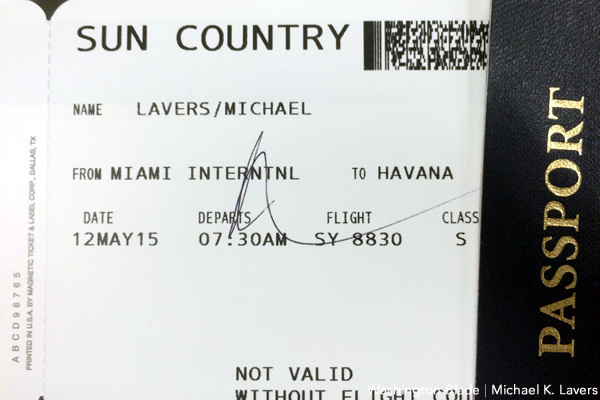 I returned to Havana shortly after 2:30 p.m. I finally had the opportunity to interview Juana Mora Cedeño, a member of Proyecto Arcoiris, an independent LGBT rights advocate, a few hours later at the Vedado home of her colleague Matute, who made me a Cuban coffee while waiting for Mora to arrive. The independent advocate in February met with House Minority Leader Nancy Pelosi (D-Calif.) during a luncheon at the Havana home of Jeffrey DeLaurentis, chief of mission of the U.S. 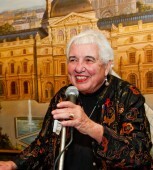 Interests Section. 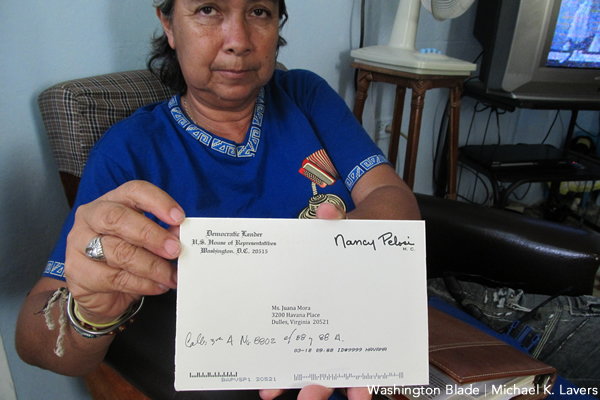 Mora showed me the letter she received from the California Democrat after their meeting. 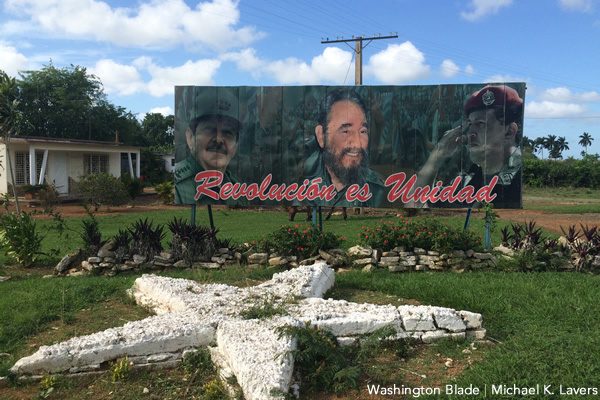 My last meeting in Cuba was an off-the-record conversation with staffers at the U.S. Interests Section on May 19. 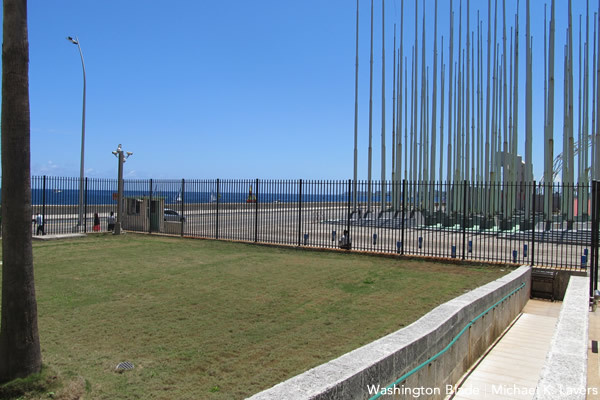 Visitors must pass through three security checkpoints that are run by Cuban personnel before handing their passport over to a U.S. Marine who sits behind a tinted window inside the building’s lobby. 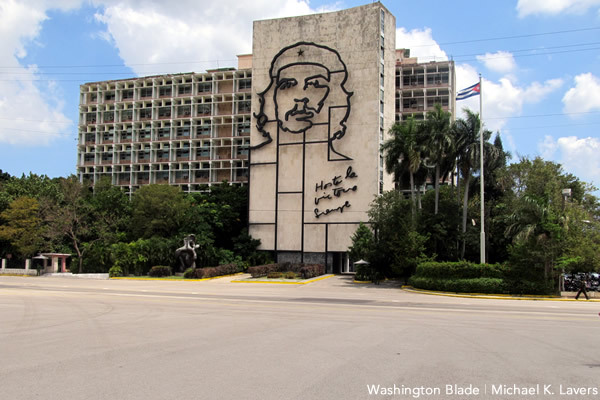 The Cuban woman who was operating the metal detector at the main entrance kept my bag, which contained my laptop and cell phone that did not work on the island, until the press contact with whom I was meeting walked me out of the building after our meeting ended. 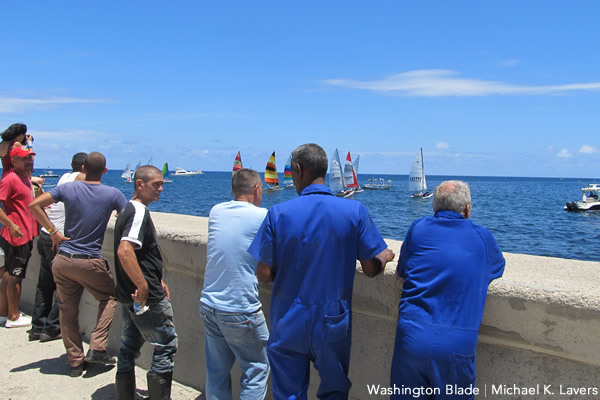 A flotilla of boats that had sailed from Key West, Florida, was just off the Malecón when I left the U.S. 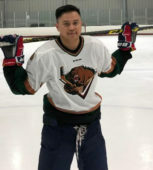 Interests Section. Personnel quickly ran out of the building with their cameras and ran across the street to join average Cubans who had gathered to watch the sailboats and other vessels that had crossed the Florida Straits to rendezvous with their Cuban counterparts. I watched the ships for a few minutes before walking to a nearby restaurant where I had one final lunch of beans and rice. I enjoyed one final Cuban coffee at Café Escorial, a coffee shop in Old Havana where I wrote my story on Gala from Humboldt 52 a few days earlier, before returning to my casa that was a block away. I took a quick shower before the taxi drove me to the airport. I landed at Miami International Airport shortly before 8:30 p.m. 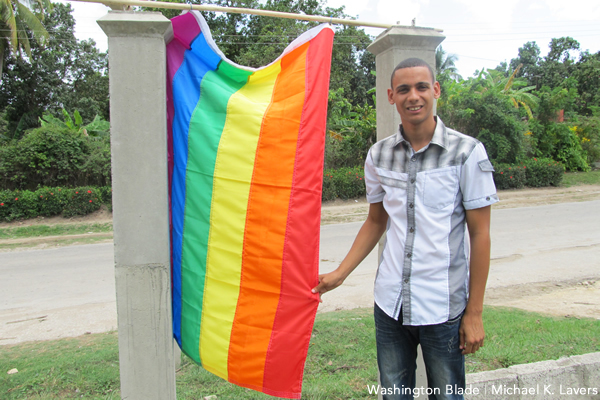 The title of this article is misleading, it should be “LGTB snapshots from Cuba”, most of the pictures are LGTB related.